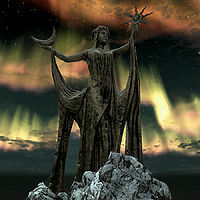 Azura is the god-ancestor that taught the Chimer how to be different from the Altmer, though some of her more conventional teachings are sometimes attributed to Boethiah. In the stories, Azura is often more a communal cosmic force for the race as a whole than an ancestor or a god. She is considered an enemy of Ebonarm and Nocturnal. She may be summoned on Hogithum, a festival on the 21st of First Seed. In Elsweyr, Azura is perceived as nearly a wholly separate entity, known locally as Azurah. She is credited with making the Khajiit out of the "forest people" living in Elsweyr, indicating Bosmer, but some sources say the Khajiit were made out of "Altmeri stock". Although she is never overtly deceitful, the way Azura always gets what she desires in the end, and how titanic events always follow her interventions, can be portrayed as disturbing. Her followers acknowledge that she is "cruel but wise". 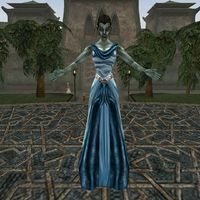 While she is considered one of the "good" Daedra by the Dunmer of Morrowind, elsewhere she has been known to be allied with Molag Bal, who is known to the Dunmer as one of the Four Corners of the House of Troubles. The people of the Iliac Bay region believe that Azura bewitches some of her followers to become her "lovers" and "virtual slaves". Azura's Star is a Daedric artifact created by the Daedric Prince Azura. In appearance it looks like a large, intricately designed throwing star or gemstone, with eight star-like prongs. In the right hands, Azura's Star acts as a reusable soul gem of almost unlimited capacity. This makes it highly sought by mages and assassins. It can only capture white souls, but was once corrupted by mortals to trap black souls instead, becoming the Black Star. The Star is often used as a symbol of Azura. An unknown agent of the Blades received the Star from the previous owner, a worshipper of Azura, in return for killing a priest in the Iliac Bay area who had insulted the Prince by condemning her sphere of egotism. Between 3E 411 and 3E 412, two friends named Charwich and Koniinge searched for the Star. It was discovered that a man named Hadwaf Neithwyr had summoned Azura in the town of Tel Aruhn in Morrowind and had accepted the Star. He then returned to High Rock, where he and his sister Peryra attempted to kill the lycanthropic caretaker of their family graveyard to power the Star. They failed, and the caretaker hid their remains in one of the crypts. Charwich found the Star, and tricked Koniinge into thinking he was dead by sending misleading letters. Charwich and his fiancée Lady Elysbetta Moorling ran away with the Star, using it to become wealthy and powerful. Eventually the Star vanished, and Koniinge caught up with both of them and killed them. The letters between the two have been published in the Charwich-Koniinge Letters series of books. The Star was returned to the mortal realm when the Nerevarine did a service for Azura in 3E 427. She and Sheogorath had a wager that Azura's priestess, Rayna Drolan, could live in silence for one hundred years. The time was almost up, so Sheogorath sent his servants to disturb the priestess on her island in the Sheogorad region of Vvardenfell. The Nerevarine banished the Mad God's Daedric servants, and was given the Star in return. Moon-and-Star is a Dwarven ring of Chimer hero Nerevar. The artifact was forged by one of the smiths of Dwemer Sorcerer-priest Kagrenac and blessed by the Daedric Goddess Azura. The ring lent Nerevar supernatural powers of persuasion and indisputable proof of identity, since any other who tried to wear it would be killed instantly. The Moon-and-Star helped Nerevar unite the warring Chimer clans, and form the First Council which included the Dwemer. Moon-and-Star played a role in the Nerevarine Prophecies, as it allowed the Nerevarine, the reincarnation of Nerevar, to again unite the Great Houses and Ashlander clans, this time in the battle against the forces of Dagoth Ur. This Ring was bestowed to the Nerevarine in 3E 427 upon killing Dagoth Ur. Little is known about this artifact outside this event.